It’s been a little over a month now, since I stepped back into radio. 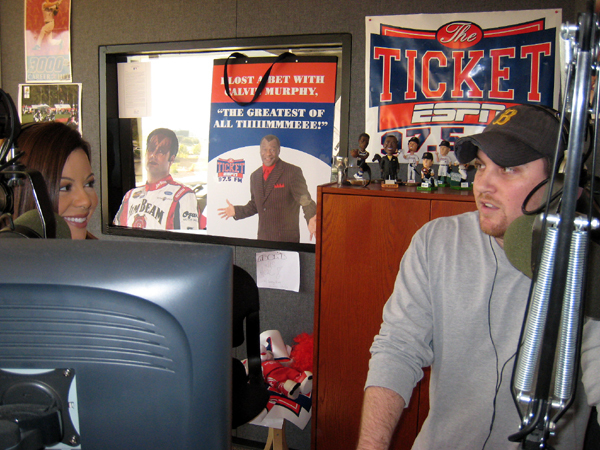 I get to work with Mike and Susan on their morning show at 89.3FM, KSBJ. Mike and Susan are SO fun to work with, but I don’t get to see them. They’re broadcasting from Humble, Texas in their KSBJ studios and I’m working from the KPRC building in Southwest Houston. Technology brings us all together though; I talk with them on-air using a mic that’s set up in an audio room close to my office. It took me a few days to adjust to the schedule. It can get really hectic now! I had to create a new work pace for my time deadlines. Instead of having about 7 minutes between reports, I now only have about 3 minutes to be accurate, versed and prepared for reports that are constantly changing. I also have to be flexible between tv and radio because the verbage is somewhat different. One minute I am talking to viewers who can see maps; the next I am speaking to people who are driving in their cars who have no visuals. There’s more leeway for conversation between Mike, Susan and I, too. That’s always interesting. Susan asked me the other day if I had mailed out my Christmas cards…Mike, in the past, has asked me about the traffic cameras and what all I can see…we’ll joke about the news too- light and funny for the ride to work. So keep in mind that after watching KPRC Local 2 in the mornings, you can continue to stay up-to-date with traffic by listening to 89.3 FM, KSBJ. I begin reporting traffic on radio at 5:30AM through 8:45AM, every 15 minutes on the quarter hour. * Over 700 children were able to receive a bag of gifts. * Over 17 different agencies were able to participate. * The same approximate amount of toys were collected as last year. * A RECORD was set for Gift Cards and Paypal which is what we really asked you for in order to make an older child’s Christmas come true! As you all know, there has been a lot of negative news regarding the economy. So, honestly….we didnt know what to expect for the amount of donations, but had hoped for the best. I am proud of our viewers, for each and every one of you, who took the time and money to contribute during such an unstable year. It took a dedicated team to make this all work out…take a look for yourself. Concerns over privacy limit what we can show you, so I have blurred parts of pictures, but there were lots of smiles in the room. Thanks again and may you have a Merry Christmas and a wonderful holiday season. We heard that this little boy was asking for a stuffed animal. He came running up to me when he saw that I had a one for him. You should have seen his eyes light up with joy! I had to thank Santa. It gets HOT up there greeting all 700 children. Here are just a few of the KPRC employees that helped out. Dozens more were there. Kim Davis is behind me. Ryan Korsgard has the blue Local 2 tee on. Bill Balleza is next to Santa. You can barely see, Gary Wann’s head near Bill. KSBJ was in attendance. Ben Oldham, John Rizzuti and his son also helped run things. Alana Gomez-Dong (one of our newer reporters) and Ginny Landers (Promotions) lent a helping hand, too. I have included this poll because I want to know what you think! It’s important because millions of dollars were spent. So, please share your opinion with me. The results are always shared on-air as well. I have also included the entire news release, below. I was going to shorten the write-up…but decided to leave it as is because I found the information to be interesting. (Houston, Texas) – At the request of the Texas Department of Transportation (TxDOT), the Texas Transportation Institute (TTI) recently completed a review of travel times and speeds along the I-10/Katy Freeway. This initial analysis of commuter benefits relative to the recently completed expansion project reveals that drivers are saving significant time during roundtrip commutes between SH 99 and the I-610/West Loop when comparing traffic conditions in June 2008 to data collected during a recent review in November, particularly during peak time hours. After opening the freeway in its full lane capacity at the end of October, commuters traveling the Katy Freeway corridor now save an average of 15 minutes of time during their morning commutes by increasing average travel speeds by 25 MPH, and save on average another 12 minutes of time during afternoon commutes by increasing average travel speeds by 19 MPH. “We are pleased about the recent survey results that tell us that drivers are saving as much as 40 – 45 minutes a day on their roundtrip commutes on the new and improved Katy Freeway,” says Delvin Dennis, TxDOT Houston District Engineer. In June 2008, drivers were averaging speeds of 33 MPH and travel times of 36 minutes during morning commutes between SH 99 and the West Loop. Afternoon commutes were averaging 35 MPH with travel times of 34 minutes. With the completion of construction, morning commuters are now averaging speeds of 58 MPH and travel times of 21 minutes with afternoon commuters averaging 54 MPH and travel times of 22 minutes when traveling this same distance. This translates to almost 2 ½ hours per work week that commuters are given back valuable time to spend in other ways besides sitting in traffic. We had freezing temperatures this evening…just in time for the holidays. Let me know what you thought. By the way, I am not a fan of cold temperatures; especially when combined with rain. I must say though…I enjoyed the brisk air, grey skies and hearing everyone get all excited over “snow”…OK OK!… “flakes” in Houston. I stopped by THE FRONT PAGE with Fred Faour and Matt Dean last Sunday (11/30/08). We talked about College Football…of course, I was a little disappointed because I had a feeling that the BCS would push OU above UT. And… they did. Since OU and the Gators won their games today….they’ll most likely be playing each other for the National Championship title. Here are some pictures from my visit to ESPN-Hou. 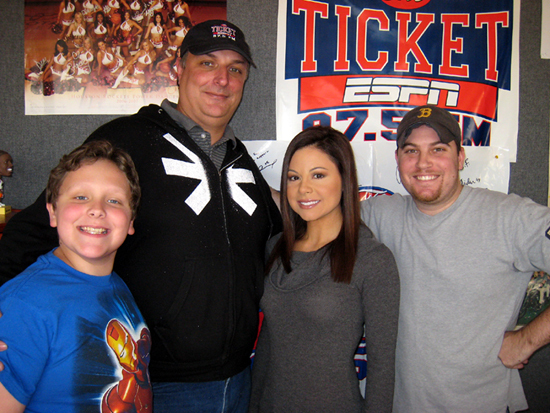 Will (Fred’s son), Fred, Jen and Matt in the studio for a snap shot. Matt is looking across at Fred.